My typical morning is when I don’t find it easy to get myself off a comfy warm bed and I don’t hesitate to snooze an alarm for the sake of five or ten minute procrastination. Today was different as I woke up to the first morning in Bagan. The plan was to go for a sunrise view from a pagoda, which was a 15-minutes ride from the hotel I was staying. 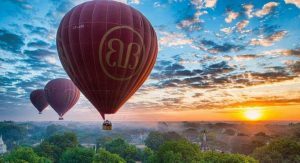 Since Bagan is very popular among tourists and backpackers alike, you’ll get spoiled by choices of transportation in getting around the town; from a taxi van to a horse cart or a rented bicycle to a rented motorbike, you name it. 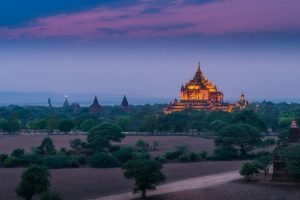 However, at this time of dawn, 5:30 in the morning, Bagan was still sleeping, unlike Bangkok where vehicle engines wake the city up with the buzzing sound so early. It seemed the vehicle my friend and I found the most suitable for us was a motorbike, which we had rented yesterday and would return later today. The owner didn’t mind to let us do so since she knew where we stayed and her shop was just across the street. Using the motorbike, we could go anywhere on our own anytime. Well, ‘anytime’ might not be totally accurate, given that it was an electric bike, which could take you as far as a limited distance of around 8 miles. This means you needed to plan your ride for 4 miles and another 4 miles for the return. If the battery runs short though and you are nowhere near the shop; either you call the owner, tell him your location so that he comes to give you a fully charged battery; or you walk the bike to the shop, as simple as that. So we set off at 5:40 am, riding a bike to our planned destination. Some potholes in a road made my ride a bit difficult. Alongside, the darkness from the scattering bushes didn’t creep me out as much as when the breeze hit the bushes. If you happen to be a fan of a horror movie, you wouldn’t be so keen to see dark bushes moving in the shadow. My mind played a trick on me at the wrong time. It got me a second thought of taking a U-turn as my friend started playing ‘what if’ jokes that was totally not funny. As we were passing one temple, a couple on e-motorbikes seemed like they were trying to map out for somewhere. We supposed they weren’t just be looking to visit pagodas at this sketchy dawn. It must be a pagoda with a sunrise spot they were trying to locate. So we stopped to ask them and were happy to know that we shared the same destination. There were four of us now. It felt more secure riding a bike with company in a dark and unfamiliar place indeed. Among many pagodas along the way, we stopped at a huge and tall one, and made sure it was the right one we were looking for. It didn’t look restricted, no fence nor gate. The pagoda itself didn’t have a door to close so we walked in freely. We used the flashlights to get to the entrance. It was very dark inside as we stepped in but we could tell the Buddha image situated in here was massive since it took half of the hall space. Of course as a Buddhist, my first reaction to Buddha image was to Wai (putting both palms together as a manner of paying respect). A one-meter width stairway led us to a second deck. There was no stairs to the third tier so we climbed up for a higher and nicer view. It was not a wise idea for me as I am afraid of heights, so I tried not to walk or move too fast. Up there, we were surrounded by a panoramic view of a dark ground covered by bushes. 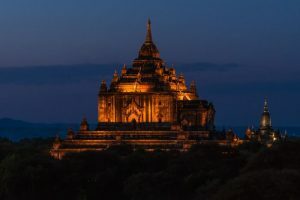 As the sun was taking over the dark sky and soon replaced it with a glowing ray of light, I was soaked with excitement to see the endless view of land full with a sea of pagodas. We were stunned while slowly sweeping our eyes over this magnificent Grandview of different styles and shapes of the seeable pagodas. The very further ones were too small to see with bear eyes. I couldn’t help but imagine how beautiful this ancient land would have been in its thriving period. This ancient land is a timeless archaeological evidence of the civilization and Theravada Buddhism that exceedingly flourished there. I tried to imagine how powerful and spiritual the rulers must have been in order to unite the people and uphold religion at the same time, especially in the age of wartime and threats outside. However, this once-thriving powerbase of then-Burma came to an end by Mongol’s invasion. While I saw many pagodas still standing tall and looking well retained, some looked so old and unrestored, like a pile of bricks as the course of time made it difficult to keep them well maintained. This reminded me that nothing is everlasting no matter how strong it is or how well it is built. The panoramic view of the whole landscape was so unforgettably priceless. It’s more worth sharing it with loved ones. I don’t find it exaggerating to say it was a dreamscape to me. Well, I could never share my impression much enough by telling it to people, showing them pictures or even writing a story like I am doing now. It was a purely expensive moment captured by memory and experience. If views and beautiful landscapes are not enough for you, there is plenty to learn about Bagan temples and the history of the site. I definitely recommend you to read Myanmar: Temples of Bagan (Travel Guide) to help you during your trip the city of thousand pagodas.